Having excellent camping and survival skills is a point of pride for many people here in Ontario. Someone who knows the ins and outs of all of the camping gear, who can build a fire out of pure willpower, who can swim across a raging river to save a cat, or who can put up a tarp that makes you feel like you’re in the Taj Mahal. These people are revered for their knowledge and skills, and looked upon as champions and heroes by the rest of the outdoorsy community. But all of this can come crumbing down in a heap of shame if you don’t know how to make a good camping dessert. One of my favorite camping desserts is the banana bowl. The banana bowl is a combination between the smore and the fried banana, and is just as delicious and ridiculous as it sounds. To make the banana bowl, start with a batch of ready-to-eat bananas. If they’re still green or over-rip this dish probably won’t work as well. Leaving them together with the skins on, cut a V shape down the length of the banana. 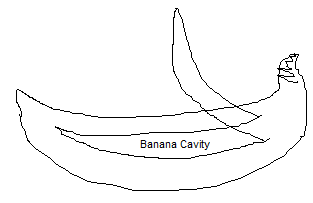 The cut should go all the way to the bottom skin of the banana, but not all the way through. You should leave a flap of skin that can be used to “close” the cavity. Inside the cavity, jam in as many chocolate chips and marshmallows as you possibly can. Wrap each banana in aluminum foil, and put it in the hot area next to the fire. Do not put it directly in the fire, because you won’t be able to get it out, and if you do it will be burnt and disgusting. The best place is just on the edge of the fire, where it is hot, but where there are no flames. Leave the wrapped bananas in for a few minutes (depending on how hot the fire is) and move them around a couple of times to ensure an even distribution of heat. When they appear to be ready, pull them out carefully and bring them to your cooking area. Using a scissors or knife, cut off the top part where the bananas connect, and serve everyone their banana bowl. If everything went as planned, you should end up with a cooked banana inside its skin, along with gooey marshmallow and chocolate melted in with it. Grab a fork or a spoon and enjoy!